Earlier this week I changed the tagline of this blog. It once read: "I have some stories. I want to look good while I share them." I didn't change it because I feared you'd think me vain. Trust me, I am vain. No need for you to wonder about that. f-word might scare away or alienate some readers. For so many, feminist is a dirty word associated with this idea of a woman who hates men, marriage, makeup, and stay-at-home moms and who is angry about everything except an announcement that Ani DiFranco is coming to town. As a happily married woman who loves eye shadow and is in awe of any woman who can stay home with a kid all day, I am a feminist who defies all those stereotypes.Well, not all of them. I freaking love Ani DiFranco! 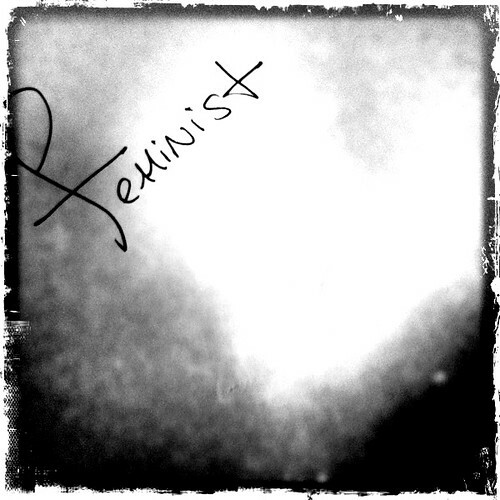 People have asked me how I can be so bold as to call myself a feminist when that label has such negative connotations. I can do so because I have a clear understanding of what feminism actually means. And I believe that if people -- both women and men -- would focus on the true definition of feminism they'd quickly realize they're a feminist too. A few days ago a pal of mine asked me via Twitter what it means to be a feminist. She then clarified that what she really wanted to know what was my definition of feminism. Feminism is simply the belief in the economic, political, and social equality of the sexes. Period. And if you believe in that, guess what, you're a feminist. Things get complicated, however, when we get into how an individual chooses to live out her (or his) feminist believes, because feminism is both personal and political. It's a lifestyle. I'm not going to write a single post on how I live out my feminism. That post would be ridiculously long and you'd stop reading and go back to watching the Olympics before getting halfway through it. But each Friday from now until I run out of things to say, I am going to address different feminist issues here at The Writeous Babe Project. I'll do my best to relate the posts to writing, but sometimes I may need to just rant or rave. I promise the posts will be interesting, as many of them will tackle those gray areas such as "Can I still call myself a feminist if I take pole dancing lessons?" And I promise the posts will be fun, because as feminist humor writer Caitlin Moran said in a recent interview, "Feminism is a revolution and revolutions are fun." Rant all you want! I love this! Javacia, thank you for sharing this. I, too, consider myself a feminist. To be completely honest, it took other women sharing what the word really meant to open my eyes to receiving the idea. These were women I met while living in the north, who have a different, less traditionally-defined way of viewing the world and its possibilities. I loved it. While I am a Southern girl at heart, I reject that women in the South have yet to learn and embrace the fact that we can define ourselves on our own terms. Perhaps we are rooted a little too deeply in how others will perceive us. I once interviewed a woman here about being a feminist. She was adamant that she was not. Today, she is a judge who beat out a man for her position. Believe it or not there was a time when I used to say things like, "I'll start calling myself a feminist when feminists stop hating men!" Now at the time I didn't know a single feminist who hated men. In fact, I only knew one person who called herself a feminist and she was madly in love with her boyfriend. But I said crap like that because I was just buying into what society said about feminists. It wasn't until I lived in California that I realized the true meaning of feminism and realized that, yes, I am a feminist. Well Javacia, I'm definitely looking forward to reading these upcoming posts! Thanks! I'm looking forward to writing them and discussing them with readers like you. Thanks, Demetria! I'm so glad you'll be joining me here with other writeous babes of the blogosphere. If you have a blog or if you're on Twitter, let me know. I'd love to follow you! As someone who was in the "I believe in equality of the sexes, but I'm not a feminist--I like men, and I shave my legs!" and now writes for a feminist blog, I'm really looking forward to these posts. Ha! Yes, yes. I have been there. very informative post. i would love to wear this kind of dresses.